Taking the time to protect your fence will pay off in the future as you can help to protect it from snow, wind, and the dangers of possible breaks. 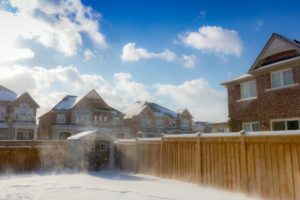 The harsh winter weather can be hard on numerous parts of your home, but it is especially important to take care of your residential fence during this trying season. Taking the time to protect your fence will pay off in the future as you can help to protect it from snow, wind, and the dangers of possible breaks. Make sure you follow these tips and tricks to keep your fence safe and secure during the long winter months. Winter means snow, and snow means damage to your fence. When your area gets a lot of snow, it will often be pushed and piled against fences from the snow plows that clear the roads. This can put pressure on the base and lower rungs of your fence, which can lead to damage in the long run. If possible, you should make sure that snow is not piled against your fence and if you can, you should remove any of that snow. If there is ice accumulating on your fence, you can try to remove it with a broom. It is especially important to remove any ice if you have a wooden or metal fence. Be sure not to use a metal shovel or other instrument to remove snow and ice, as these can damage and scratch any paint on your fence. During the winter, your fence may be more prone to breaks. Ice and snow can quickly weigh down tree branches, causing them to break from the trunk and fall on your fence. Before winter hits, make sure that overhanging branches and dead trees are either removed or trimmed back to prevent any future winter breaks. Cars and snow plows also can cause a threat to your fence, especially during the prolonged darkness of the winter. You can use reflective markers or tall flags to show where your fence is along your driveway to road. Lastly, it is crucial to be sure that your kids do not climb on your fence so that they do not get injured or break the fence. Over the winter, it is really important to keep up with fence. Regularly check for any breaks, cracks, or weak points and be sure to fix these as early as possible to prevent any further damage. If you have a wooden or metal fence, try to go easy on the chemical de-icer, as you do not want to cause any corrosion or long term damage. If you have more questions about winter fence maintenance, Hercules Newport New is here to help you. Winter maintenance can be daunting, but we are here to answer any questions you may have. Our trained professionals have experience in wood, aluminum, chain link, steel, and vinyl fences. We have offices in Manassas, Richmond, Newport News, Norfolk, Maryland, and North Carolina. Get a free quote today and give us a call at 757-316-2600 or visit us online. This entry was posted on Friday, January 25th, 2019 at 11:29 am. Both comments and pings are currently closed.